FCIT is currently offering technology integration training in Ft. Lauderdale, Gainesville, Lakeland, Naples, Orlando, Pensacola, and Tampa. 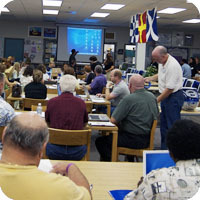 For a list of one-, two-, and three-day workshops, please see our Upcoming Workshops page. For a list of our four-day Summer Teaching and Learning Institutes, please see our Institutes page. You may register for any of our training sessions using the online registration system.